A very special event on the Champions Tour, this tournament is held at Pebble Beach Golf Links and Poppy Hills Golf Course. Each foursome includes a Champions Tour Player, an accomplished junior player (age 15 to 18) and two paying amateurs. This format is a fantastic opportunity for spectators to see past champions play alongside the future stars of the PGA and LPGA TOUR. Admission is free to this event. The TaylorMade Pebble Beach Invitational is a unique tournament that matches players from the PGA, the LPGA, the Champions, and Nationwide Tours in head-to-head competition for the same purse. Additionally, four amateurs play with a different pro each day. 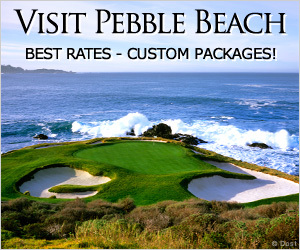 The TaylorMade Pebble Beach Invitational is held on Pebble Beach Golf Links, Spyglass Hill Golf Course and The Links at Spanish Bay. The AT&T Pebble Beach National Pro-Am is a 72-hole PGA TOUR golf championship dating back to the 1930's when Bing Crosby gathered a 'few friends' to raise money for charity and have a little fun. Top PGA Tour professionals team with Hollywood celebrities, world renowned musicians and the captains of industry as they compete for a $6.8 million purse.